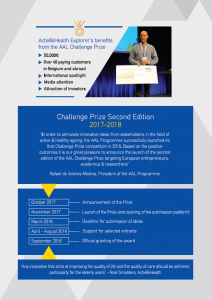 On the 6th of October, within the AAL Forum that took place so constructively and with such success at Coimbra, the president of AAL Programme, Rafael de Andres Medina, announced the 2nd Edition of the AAL Challenge Prize. The 1st Edition of the AAL Challenge Prize, the Smart Ageing Prize, was successfully conducted in 2016. The prize looked for innovations in internet-connected devices (Internet of Things) that empower older adults to achieve the quality of life they aspire to, socially and independently. The winner was the company Activ84Health and its application, Activ84Health Explorer (that has since been renamed “Memoride”) which allows older people, unable to get about as they once could, to explore familiar areas from their past, using a stationary bike and Google Streetview. The application has created a lot of emotion for elderly people who managed, even only virtually, to “wander” in forgotten routes, opening to them a window on the world. Winning the prize had many benefits for the company: having received the 50,000 € funding, they have acquired over 40 paying customers in Belgium and abroad, found a place on the international spotlight, obtained media attention and attracted the interest of investors. 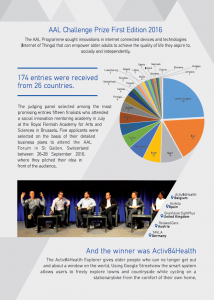 Based on that experience, the expextations for the 2nd Edition of the AAL Challenge Prize. The topic will be officially announced when the prize is launched in November 2017, but it can now be revealed that it will be related to connectivity, social participation and quality of life. The prize aims to enhance the networks and social experiences of older adults, offline, in the real world, through innovative digital technologies.